Love these bathmats. Large and lush and the Greek key pattern makes them looks so expensive. Definitely would buy this particular item again. Step out of your bath or shower and step onto sumptuous softness and comfort with this set of two bath mats from the Superior Collection. Made from 100-percent Egyptian Cotton, these spa quality rugs are machine washable for easy cleaning. With their cheerful colors and classic style, these rugs enhance your bathroom's decor. A classic geometric pattern borders each rug and provides visual appeal. Tip: We recommend the use of a non-skid rug pad to keep the rug in place on smooth surfaces. I bought these in the color "Linen"and they look exactly true to color as the photo shows. I washed and dried them as soon as I received them which made them thicker and softer. They are nice, heavyweight floor towels. Some people call them bath mats, but I've always called them floor towels. You use them to step on when you get out of the shower. I prefer floor towels to rugs because they are washable and hold together much better if they are washed frequently, which most people do. I don't like rugs in the bathroom because they fall apart if they are made out of that yarn stuff with rubber backs, plus rug tend to get lint-y. 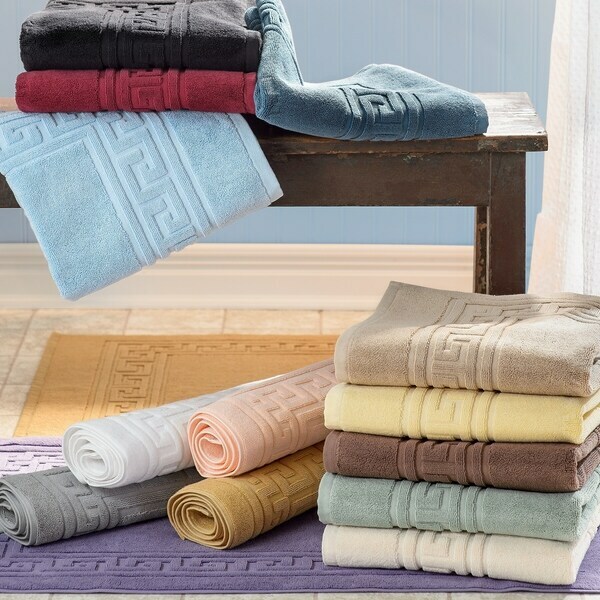 These are not those rugs...these are the thick, comfy towels that don't slip and are fresh and clean each time someone bathes since they are much easier to take care of. Love that they come in sets of two, and I will be buying more in the future. Buy these, you won't be sorry! I LOVE these bath mats SO MUCH that this the 3rd set I'm ordering!! This time around, I ordered Sage; I previously ordered Light Blue and Gold. They are soft, absorbent, and true to color. Please believe me, they are so much better than the "traditional" bath rugs with the rubber backing in that they wash up very well (are colorfast too) and are more hygienic in that they are easier to keep clean and fresh. Speaking of washing, for those who think these mats are too thin, I agree with another reviewer that stated they laundered them first; I tried this and it does indeed make them thicker, softer, fluffier, etc. once you take them out of the dryer. Because these mats are made of cotton, like a bath towel, they pretty much stay in place and there's little chance for them to slip and slide around very easily. Instead, your feet will meet nothing but soft, absorbent comfort after your bath or shower. These bath mats are of excellent quality, don't pass them up!! These bathmats are the thickest plushest I have ever purchased. You will not be disappointed if you buy these. One word of caution: They have "quality" tags on them and you can't just pull them off because they are attached to the threads. If you just pull on them, you may start a "run" in them. Take a second to go get a pair of scissors and cut the tag off. Out of the package, I wasn't thrilled with the appearance of these bath mats. But after washing, they are softer and fluffier. I did not rate them "excellent" because I feel the price is a little high. I expected them to be thicker and more plush at this price. I do really like the sculpted edge design though - gives a sophisticated, high-end look to the mats. I ordered "toast" and the photo is mostly accurate for the color - perhaps a little more mustard-y than I expected. My towels and bath rugs are "camel" color but "toast" blends well enough:-) NOTE, from reading through the reviews there seems to be a lot of confusion about bath mats vs. bath rugs. These are MATS to use when getting out of the shower or tub - "floor towel" is a great description. We hang it over the shower door to dry after each use and wash it with our towels. I really love these bath mats or rugs. I use one for a rug by my sink and I use the other one by the bath tub. That one gets put up between uses. I got tired of my other rugs being hard to wash and how much they showed use. So, these are the perfect rug for me. I love the color and it was right on. I want to buy more for gifts, share the good things in life! They are true to color and not a rug, but bath mats. Lovely border design and easy to wash. A very ood size. I purchased these rugs because I did not want the typical bathmats that you cannot wash and are of the woven design/pattern. These rugs are extremely soft, they are nicer than my actual bath towels. The best part about these is that they are very thick and can be washed. I would definitely recommend these. The quality seems to be excellent and I believe they will last a long time. Good quality bath mats and match the Egyptian cotton towels I bought. Not plush with backing, more towel-like mats. Excellent for cleaning. Bought in black and keeps its color. This is not a rug. It is bath mats. The quality is very nice. Would purchase again. Love the quality of the cotton and the feel underfoot The pale blue has not washed well and just a few weeks later the dye is becoming splotchy. These are actually much nicer than I anticipated. Very thick, well made bath mats, the quality you'd find in finer hotels. I bought these BECAUSE they don't have the non slip rubber backer - they're just terry toweling. Those rubber backers smell bad, fall apart over time, and are very hard on your washing machines. Highly recommend. It's a bath mat what can I say! Ordered the white bath mat, good quality, thick and yet soft, holds up fine with washing. These mats are NOT superior and luxurious in any way. They are thin and are not safe...standing on them Is akin to ice skating....they will move with every step (my flooring is tile). They could easily be mistaken for bath towels, although my bath towels are heavier than these. I bought this set of bath mats in the light grey or silver color and liked them so much I went Back and ordered the canary. They are Top Quality, absorbant, wash well And look exactly as pictured with the Greek key pattern around the perimeter. This is a mat, not a rug so that might be where some confusion lay in other reviews. I feel this set of 2 is well worth the money. I bought the gold bath mats and they really are gold. Not metallic gold, more like English mustard but definitely not brown or yellow. Sometimes it's hard to tell on the monitor. Excellent quality. Old fashioned style everyone needs and can't find. Thick cotton that washes and wears well and feels good underfoot. Good bang for the buck. I ordered taupe but received in the gold color. I asked the gift recipient about her preference and she like the gold so I went with it. As it turned out the taupe was no longer available. The mats are excellent, feel so good on your feet and absorb well. This is the perfect bath mat that I was looking for. It has great quality thickness and yet soft and plush. So soothing on your feet when you step out of the shower. Throw right in the washing machine and it comes out just like brand new! Hard to find nice bath mats. These are good quality. These are super thick and the color is very pretty. These are good bath mats but wish the color selection was available as pictured . I love these! Just throw in the washing machine with my towels every few days! "I need these towel mats in the gray/silver but I can’t find that option. Can you assist?" "Do you offer these bath mats in other dimensions and if you do, where can I see the sizes available and how to order?" "Are there coordinating towels with greek key design and color match?" "What are the care instructions on the white ones? Can you use chlorine bleach on them?" Yes, you can bleach the white ones. You would not bleach the colors. Otherwise, they are machine wash and dry. "How many ounces does one mat weigh?" Hello landslide1950, each Superior Collection Luxurious Egyptian Cotton Bath Mat (Set of 2), weighs approximately, 900 grams per square meter. Have a great day. "dimensions of thse mats please"
Hello irishlady, we appreciate your inquiry. The dimensions are 22 inches wide x 35 inches long. We hope this information has been helpful. Thank you for shopping with us!